If you are looking for a marathon which is off road, picturesque and challenging then running the Clarendon is the ultimate. 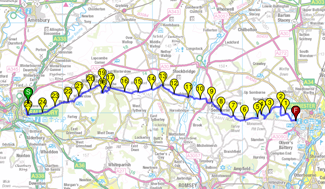 Our route takes you from Salisbury to Winchester along the ancient Clarendon Way with a few extra turns here and there to make up a full 26.2 miles. More than 90% is off road, with the trail following country tracks and paths - many of which have not changed since being travelled by the ancient Kings and Queens of England. In addition to the full marathon distance, we also have a half marathon event and this year we are also introducing a mini run of just 5 miles. If you want to join us but are not able to run the full course, please feel welcome to get a team of 4 together and run in a relay or enter the mini and run in with us for the last 5 miles. Our marathon event was first run in 1998. It was founded and organised by Paul Elderkin, a keen runner and member of a local Hash House Harriers Club. In 2012, Paul passed the management of the race over to the Rotary Clubs of Winchester and Salisbury. The race will be on Sunday 6th October 2019. The entry fee for 2019 is an inclusive one. All entrants will be given a free medal and a free tshirt when they cross the finish line. Use of the buses will also be included. £35 for the full marathon (26.2 miles). £25 for the half marathon (13.1 miles). £20 for the mini (5 miles). £80 for a 4 person relay team. Bookings before 1 June are at at the above early bird prices. On 1 June prices will be increase. Online entries will close on Sunday 22 September 2019. It will still be possible for runners to book on the day but an additional late fee of £10 (donation to Rotary charities) will be requested. If you are booking on the day, you can still use the buses. Clarendon coffee mugs are available for £10 each. A massage after the run will cost £10. If you wish to use the event as an opportunity to raise funds for your favourite charity, all the money that you raise can be put directly to your charity (100%). Your early bookings are much appreciated as this helps us when we are forecasting how many tshirts and medals to order and lots of other things. Please book as early as possible. Why not run 'The Mini' only the last 5 miles! In 2016 we introduced our new mini run which allows runners to join us just for the last 5 miles. This run starts in the middle of Farley Mount Country Park at 1.45pm (bus leaves Kings School Winchester at 12.30pm). The cost is £20 per ticket and this includes the cost of a bus pass to get there and when you have completed the run you will also be given a special tshirt and medal. This is a great opportunity to join other friends that are running in the full event. It will also be a good starting point for very young runners who would like to get a feel for what it is all about. Maybe this year you can run the mini, next year the half marathon, and the year after you can attempt the full marathon distance. You can see a detailed map of the full marathon route by opening this external map page - it will open a new window in your browser. Please note that we start at Salisbury and finish at Winchester. The mile markers count down, 26 miles as we leave Salisbury, 1 mile as we get close to Winchester. When you click on this map, the mile markers are in the correct places but the F and the S are incorrect. In addition we also have a graph showing ascent and descent (hills and valleys). Click here. We have also created a GPX file of the Clarendon Marathon route, for those who know how, to download and upload to their GPS watch. You can download the file here. Please be aware that you download any files at your own risk. While we do all we can to ensure no viruses or malicious scripts are present, you should always make sure you have the latest anti-virus definitions on your computer. Click here for full results for 2018. Click here to see photos for 2018. Click here for the 3 minute video (Trailer for Clarendon The Movie 2018). Click here for the full 36 minute video (Clarendon The Movie 2018). Clarendon 2018: Anna's Story, leg 2,3,4!